In this 20-minute interview, Hulst and I talked about how Guerrilla went from the dark gritty landscapes of Killzone to the vibrant world of Horizon, how they learned how to tell stories, and the magic formula (or lack thereof) that made Horizon so great despite the fact that the studio had never made an open-world role-playing game before. Jason: You mentioned focus groups and testing features—were there any examples you can remember of times during development where you were going one way and then it turned out to be the wrong direction for the game, and you had to turn around or make big changes? Can you think of any examples where you had to overhaul or you had some big challenge, some sort of obstacle? Hulst: These things tend to be very detailed. I think at some point we had a, not a robotic mount, but we had a horse in there and that just didn’t feel right, and people weren’t sure if that fit well into the world that we were putting together and the story. There are literally hundreds and hundreds of things that are slightly broken, and in themselves they’re not gonna ruin your game, but when you get all of them right, it creates magic. That’s how we approach that—all the leads of all disciplines are involved in the playtesting. They’re actually forced to watch people play their game, not just look at some spreadsheet that comes back with some scores. You’ve gotta understand and watch people play your game. That’s how you learn to make it better. Jason: You guys were in development for six years? Seven years? Hulst: We started the pitching process late in 2009. So 2010 we started concepting. We should probably acknowledge the fact that for five, six months when we were finishing Killzone: Shadow Fall there was hardly any activity on Horizon: Zero Dawn. 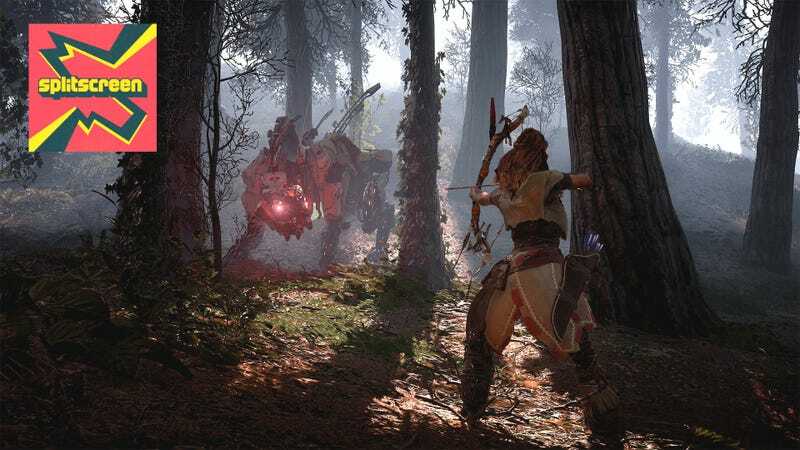 I would say all in all about six years, maybe six and a half, is the full production cycle of Horizon: Zero Dawn. So it’s been a very long time. But that’s kind of what you need when you do your first game in a new genre, it’s a new IP, it’s your first open-world game. It takes time. But we didn’t always work on it with a full team—we started with a few guys and scaled that up to maybe 20 people for the first few years. I don’t want to make it sound more expensive than it was. Jason: So it’s safe to say it won’t take six or seven years for the sequel? Hulst: No. We’re going to have to see, but we obviously learned a lot of lessons, as we did from doing a launch title. So we’ll bring that into our development processes going forward. Listen to the full interview for more. As always, you can find Splitscreen on Apple Podcasts and Google Play. Leave us a review if you like what you hear, and reach us at splitscreen@kotaku.com with any and all questions, requests, and suggestions.